Militant leader Abu Musab al-Zarqawi has reportedly declared war on next Sunday's election in Iraq. An audiotape on an Islamist website purportedly voiced by the Jordanian-born militant calls on Sunni Muslims to fight against the vote. "We have declared a bitter war against the principle of democracy and all those who seek to enact it," the speaker says. Zarqawi has claimed responsibility for many bombings and beheadings in Iraq. The US has put a $25m (£13m) reward on his head. It attacked democracy as a springboard for "un-Islamic" practices, claiming that its emphasis on majority rule violated the principle that all laws must come from a divine source. "Candidates in elections are seeking to become demi-gods, while those who vote for them are infidels," it said. The speaker reserved particular scorn for Iraq's Shia majority, whose parties are widely expected to win next Sunday's election. The Shia, it said, were poised to spread "their insidious beliefs" to Baghdad and Sunni-dominated areas of Iraq. 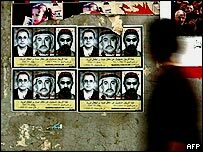 Zarqawi claims to have masterminded several attacks on Shia targets, including a car-bombing in 2003 that killed Ayatollah Muhammad Baqr al-Hakim, former leader of one of Iraq's two main Shia parties. A message attributed to Zarqawi earlier this week accused the Shia of taking part in the US assault on the Sunni Muslim city of Falluja and described their spiritual leader, Ayatollah Ali Sistani, as "Satan". Iraqi interim Prime Minister Iyad Allawi has meanwhile told the BBC's Breakfast with Frost programme he believes the polls will eventually spell the end of violence in Iraq. But, he said, this will not happen immediately and insurgent attacks are likely to continue in the short term. The interim government has announced sweeping security measures to protect voters in the 30 January election.